What is common between Brazil, Russia, India and China? That’s easy. They are the so-called BRIC countries. But, what is common between these BRIC countries and other emerging economies such as Indonesia, Argentina and South Africa? The answer: inequality. This disconcerting connect between these emerging economies is the focus of a report released last week by the Organization for Economic Cooperation and Development (OECD), the think tank for the club of rich countries. The study (www.oecd.org/dataoecd/40/13/49170475.pdf) focuses on worsening inequality in the last two decades in emerging economies, coinciding with what many believe to be the golden years of reform in India. While stray news reports flagged the study, they missed the central import in the detail: the new policy challenge being faced by emerging economies, particularly for India. Fighting poverty is one thing. But doing so in the backdrop of rapidly growing inequality is another. Inequality is a tax on the poor and, therefore, leaves them poorer. In other words, any gains that may have accrued to them through social spending programmes or the trickle-down effect of rapid growth would be reversed. The OECD study only confirms what has been indicated in the consumption data generated by the National Sample Survey Office (NSSO). The graph shows that inequality, as measured by the Gini coefficient (derived using consumption data), worsened in the 1990s and the first decade of the millennium. More worrying in the OECD study is the revelation of how India stacks up against other emerging economies and the world in general. Not only is its spending on social sector programmes the lowest, India’s tax-to-gross domestic product (GDP) ratio—a good measure for redistribution of wealth in the economy—is way below that of other emerging economies. A double whammy. To make matters worse, the past three years has seen the prevalence of double-digit inflation—something that impacts the poor the worst. And then the latest round of data on employment released by NSSO shows that between 2004-05 and 2009-10, when growth averaged nearly 9%, the economy added 200,000 jobs every year compared with an average of 12 million in the previous five years. This phenomena of jobless growth would have only worsened the circumstances and spurred inequality. So, are we surprised that the OECD study finds India to be among the countries exhibiting the worst trends in inequality? All the more, given that the tax-GDP ratio is way below that of other emerging economies. 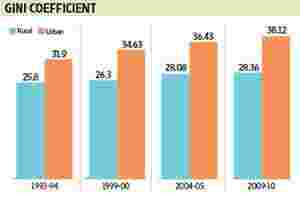 While the ratio improved marginally for India from 14.6% in 1995 to 18.9% in 2007, over the same period it rose from 9.8% to 20.7% for China, 26.8% to 33.4% for Brazil and 20% to 29.1% for Argentina. Only Indonesia fared worse, dropping from 17% to 12.8%. The government has clearly passed up on the opportunity to rake in some much needed tax revenues by tapping the profits generated by rapid economic growth. (An interesting point given that corporate India is often crying hoarse about how India’s tax rates erode their competitiveness). And unlike OECD countries where the average is about 32%, consumption taxes account for over 50% of tax revenues in emerging economies such as China and India—by definition consumption taxes are regressive as they have an inflationary impact which worsens as you go down the income ladder. As the study points out, fixing the tax system to make it more equitable will take time and doing. Spending on public programmes, on the other hand, is relatively easier to undertake, but equally difficult to finance. An interesting dilemma indeed. There is no way out though. The evidence furnished by OECD only confirms what the NSSO data revealed (though not many so far have been willing to buy it). Fixing inequality is not an option, but a necessity. How a government, politically so vulnerable, can even begin to go about it is another matter altogether. A recipe for disaster? Anil Padmanabhan is a deputy managing editor of Mint and writes every week on the intersection of politics and economics.